Are Tonneau Covers Waterproof, and Can They Keep Water Out? Home » Blog » Are Tonneau Covers Waterproof, and Can They Keep Water Out? Are truck bed covers waterproof? 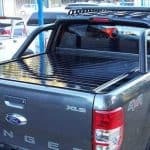 When you purchase a tonneau cover for your truck, one of the main reasons that you are looking for a cover is to protect your truck bed and your cargo from any inclement weather that you may encounter during your travels. Of course, the cover will help protect your cargo from the rain, but many of the tonneau covers that you can find on the market are described as water-resistant instead of water-proof. Well, when something is water-proof, it will keep all of the moisture out of the cover, but one that is only water-resistant may occasionally have leaks that you will have to deal with. These leaks may be minor, but they should still be noted so that you do not place cargo in an area where it could potentially get wet. So, where are these leaks most likely to occur? The area at the front of the truck bed that connects to the cab of the truck is an area that often gets a lot of rain and wind, so if there happens to be a slight space between the cover and the truck, rain can get in, especially if you are driving or it is windy outside. These spaces do not need to be large; in fact, to the naked eye, you may not even be able to see that there is a space for the water to get in. Read more: Tonneau Cover Affects Fuel Economy! Another area where water can trickle into a tonneau cover is the area that is near the tailgate. In most trucks, the tailgate is not connected tightly to the rest of the truck, so if the wind is strong enough to blow the rain into the cracks, water can easily get under the truck bed cover and cause the bed to become damaged over time, especially if the water sits in the bed of the truck for a while. There are kits that you can purchase to seal the tailgate and block water from getting in. Since these covers are considered to be water-resistant, they are not going to keep the water out completely. Being that they are not 100% waterproof, you will need to either secure the cover so that no water can get in or find a way to allow the water to drain when it does get into the bed of your truck. More than 99 percent of the time that you are driving in the rain or the snow, your truck bed cover will keep your cargo dry, but you can install a gasket into the floor of the bed to help drain the water whenever you need. Rain is not the only way that water can get under your tonneau cover; in fact, even though many of these brands are designed to be washed and cleaned in a car wash, the high pressure of the wash can force water into the bed of the truck. This is especially true when you have a roll-up tonneau cover that is soft, which means that the edges of the cover may be secured with Velcro. In general, the most water-resistant models that you will be able to find when you are looking for a new tonneau cover is going to be a hardtop option that is crafted from hard plastic or fiberglass. This type of cover will often overlap the rails and the tailgate, which means that normal rain will not be able to enter the cover easily. The next tonneau covers for water resistance are tri-fold covers because they offer a lot of the same protection as a hardtop. Best Retractable covers are also quite effective because they have compression seals at the back of the bed near the tailgate so that leaks do not occur, and the rest of the cover is positioned on tracks. Soft roll-up covers can offer quite a bit of protection, but water can seep into the area between the cover and the rails, especially if the clamps are not as tight as they could be. Snap covers tend to be even less water-resistant, so if you are looking for a more affordable option, remember that it may not be as good at protecting the bed of your truck and the cargo that you are hauling under the cover. As you can see, most tonneau covers will protect the bed of your truck, but they are not 100 percent effective, regardless of the type of cover that you prefer. Some truck bed covers can perform better than others, but if you need to keep your cargo dry, make sure that you do some research into the topic to make sure that you know which cover works best for your truck and how you can prevent leaks from happening. Not all truck bed covers are going to provide a snug fit on your truck bed, but the better the fit is, the more water it will be able to resist. Do Tonneau Covers Really Save Gas and Thus Improve MPG?